ONE YEAR ONLY EAGLE FAMILY DESIGN -- For the first time in the series, John Mercanti depicts a family of eagles rather than a solitary one. A mother bends over toward her nestling in the foreground while the father returns above. 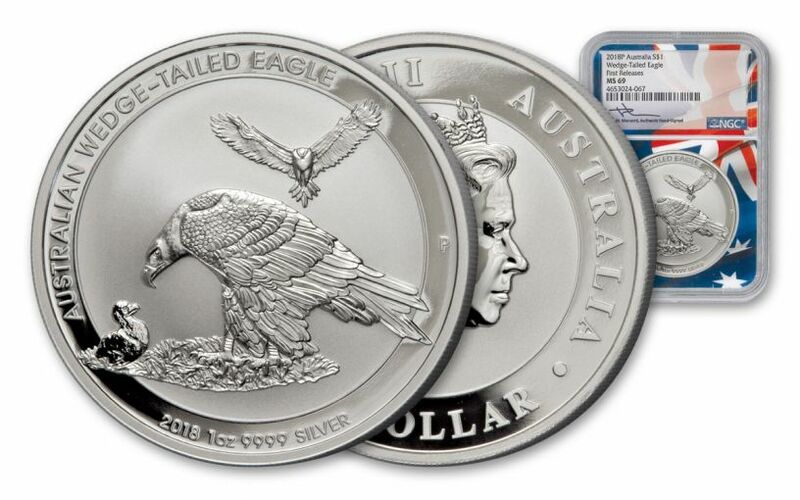 Unlike the two previous designs in the Wedge-Tailed Eagle Series, which were used for two years, the 2018 edition's reverse image will only be used once. CERTIFIED NEAR FLAWLESS WITH FLAG CORE -- Your coin will be graded Mint State-69 (MS69) by Numismatic Guaranty Corporation (NGC), a distinction that means your almost-flawless coin will showcase an impressive full strike and indistinguishable imperfections -- well above and beyond the quality of the vast majority of coins in the series. It has been set in an Australian flag core. The bald eagle has long appeared on American coins, so John Mercanti, who created the eagle design that has appeared on the Silver Eagle since the coin's debut in 1986, was a natural fit to design a coin celebrating Australia's largest bird of prey, the wedge-tailed eagle. 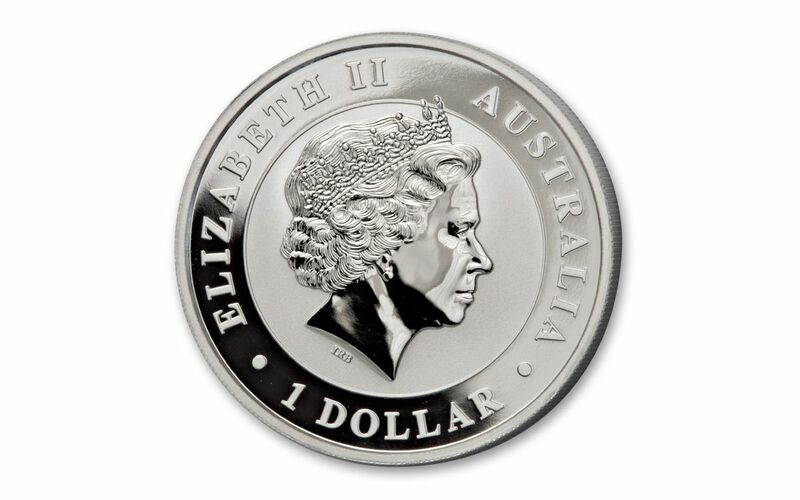 Mercanti's skill in design and engraving and the Perth Mint's exceptional production quality combined to bring about this beloved series. 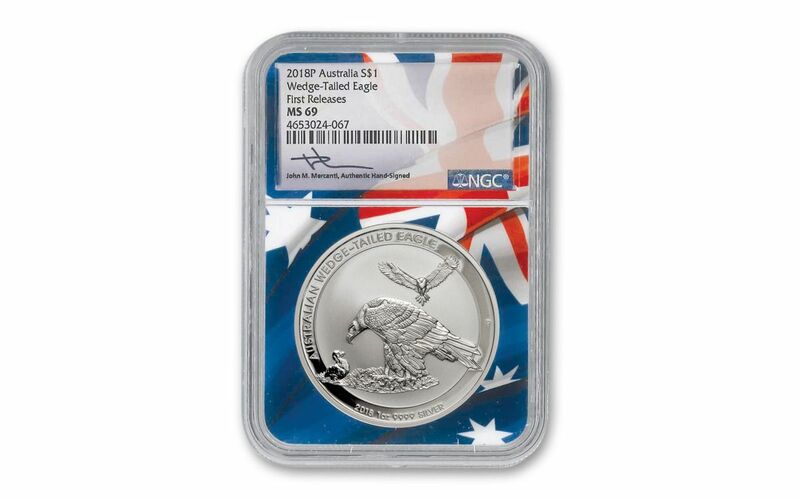 This one year only family of eagles design is sure to have particular appeal to collectors. 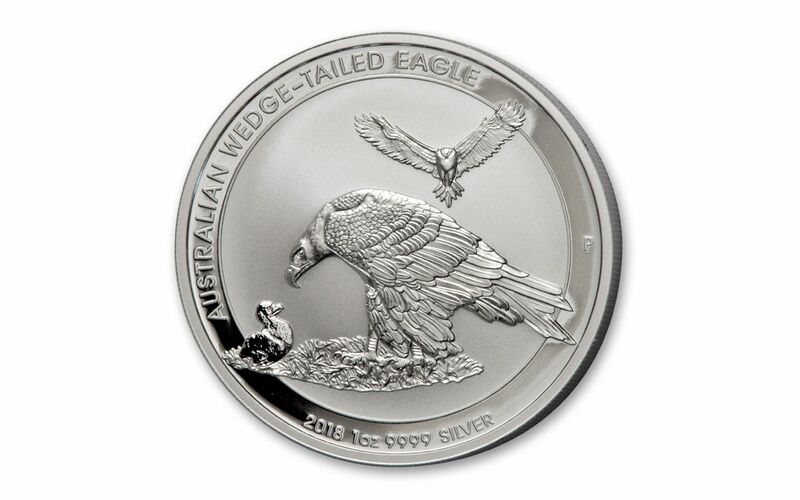 With a mintage of only 50,000 pieces, your chance to own this 2018 one ounce Silver Wedge-tailed Eagle will not be around for long, so order yours now at GovMint.com!